Romania on Monday said it would kill or relocate 140 bears and 97 wolves following a rise in the number of attacks on humans, sparking outrage from animal rights groups. The measures aim to "prevent important damages and protect public health and safety", the environment ministry said in a statement. A government-appointed commission of scientists backed the move, saying that it did not "endanger the conservation of these two species". The decision to let the authorities carry out the killings also "prevents trophy hunting", according to the experts. But the World Wide Fund for Nature (WWF) strongly denounced the measure and blamed the issue on deforestation. 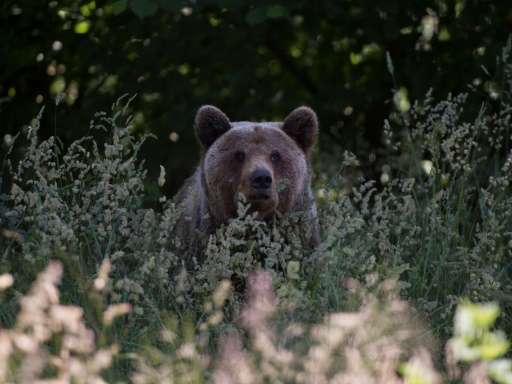 "The authorities should first address the problems that have prompted bears to get closer and closer to human settlements in the search for food," Cristian Papp, the head of WWF's Romanian branch, told AFP. Last October, a similar outcry forced the environment ministry to retract quotas allowing hunters to kill 552 bears, 657 wolves and 482 lynxes. Romania's vast areas of virgin forest are home to around 6,000 brown bears—some 60 percent of Europe's population—which mostly roam the Carpathian Mountains. In recent months, an increasing number have entered towns and villages looking for food. In July, two shepherds were seriously injured in a bear attack in the Carpathian region. A month earlier, authorities were forced to temporarily close the famous Poenari Castle—the inspiration for Bram Stoker's gothic novel "Dracula"—after tourists came face to face with a mother bear and her three cubs. I can understand killing the bears and hyenas both of which attack humans. And I could understand the killing of wolves to, but I thought studies showed wolves don't attack humans.